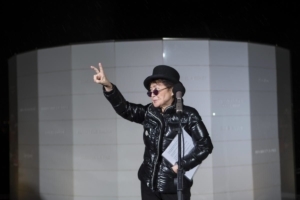 Yoko Ono is in Iceland today. 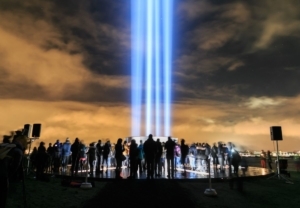 She makes a pilgrimage each year to the Imagine Peace Tower in Reykjavik on John Lennon’s birthday, which was yesterday. I will be making my own pilgrimage to the Imagine Peace Tower later this year. When I go, I will be taking thousands of heartfelt wishes for peace with me to place in the base. I’m collecting these wishes everywhere I go and from the more than 500 people who visit Lovegrove Gallery & Gardens each day during season. If you’d like me to take your heartfelt wish for peace to Iceland, swing by or contact the gallery. The number is 239-938-5655. 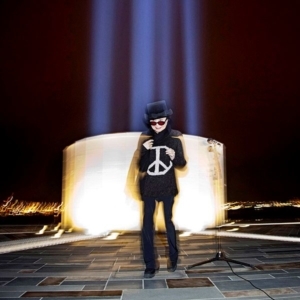 The Imagine Peace Tower is a work of art conceived by Yoko as a beacon to world peace. In case you don’t know, Yoko is a legendary conceptual artist in addition to being a musician and peace advocate. She designed the tower in the form of a wishing well that emits a powerful tower of light beams. The words IMAGINE PEACE are inscribed on the well in 24 different languages. The light tower is composed of a number of individual lights that join together to form a single beam. Six of the lights t ravel through corridors across a platform that surrounds the well and are reflected upwards to the sky with mirrors. An additional nine lights shine straight up to the sky, strengthening the tower of light. The strength, intensity and brilliance of the light tower continually change as particles in the air fluctuate with the changing weather and atmospheric conditions unique to Iceland. The electricity for the light comes entirely from Reykjavik Energy, which produces the electricity from geothermal power. 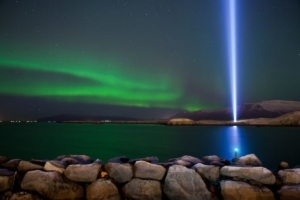 The construction and installation of the Imagine Peace Tower was done in collaboration between Yoko Ono, the City of Reykjavik, Reykjavik Art Museum and Reykjavik Energy. 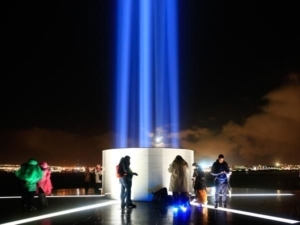 The Tower was dedicated during a private ceremony on October 9 in 2007 on Viðey Island, Reykjavík, Iceland. 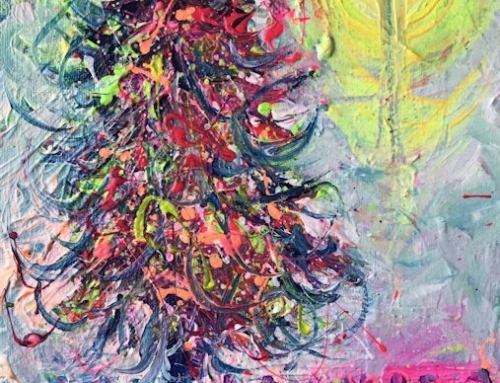 The artwork was dedicated to the memory of John Lennon on what would have been his 67th birthday. 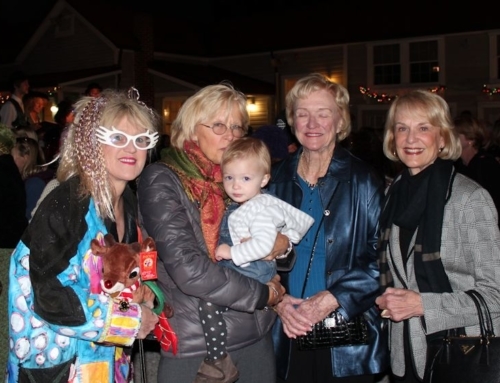 Since then it lights up the evening sky annually from October 9th to December 8th. The latter date is the anniversary of his death in New York City. 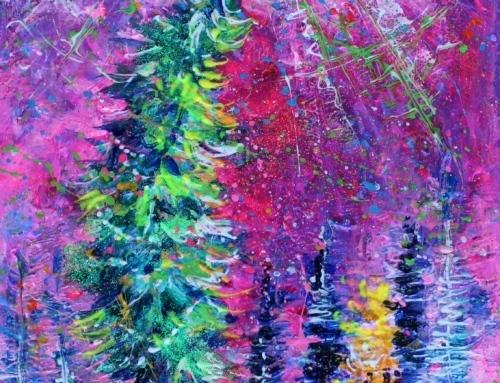 It is also lit during the winter solstice for one week, on New Year’s Eve and on Spring Equinox for one week. So how did I come up with the idea of taking Heartfelt Wishes to Reykjavik? Come back tomorrow and I’ll tell you.